To the British administration Oughterard was a prime location for a base from which to govern and dominate the wild lands further west. In an account written to the British government, Richard St. George Mansergh reported that “Connemara is the asylum of outlaws, deserters and persons escaped from justice, the stronghold of smugglers etc” and maintained that “there are at least 2,000 stand of arms dispersed in cabins and two battalions of deserters” ready and willing to rebel against the crown. This made a base in the region of critical importance to the British powers. The British Military Barracks in Oughterard was situated about a quarter mile north of the settlement in the townland of Ordnance Ground. 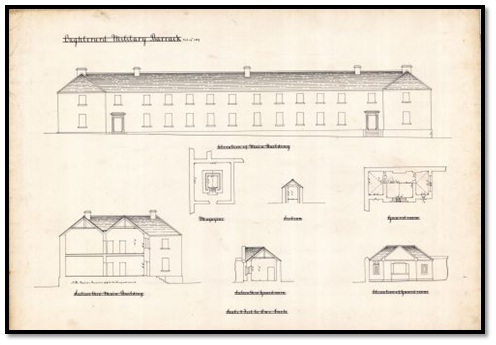 Its exact construction date is unknown; however, a letter exists in the British Archives from the Duke of Bedford (the then Lord Lieutenant of Ireland) from 6th May 1758, which requests “authority to grant the amount necessary to build a barracks at Oughterard”. This would in all probability make the barracks to some extent contemporary with the two landed estate houses of Clareville, owned by the Martins, to the west of the settlement, and Lemonfield, owned by the O’Flahertys, to the east. Hence the presence of the barracks was most likely an important feature in the shaping of the modern-day town.